Allison Cecilio at International Yacht Collection is offering a special charter rate on the 44.8m motor yacht Lady M in Florida and the Bahamas this winter. Built to ABS class by Intermarine in 2002, she features a five stateroom layout for 10 guests with a large master suite on the main deck and four oversized staterooms below. A highly customized interior is finished in honey-glazed maple woodwork accented by gold and neutral tones. Twin Caterpillar 2250hp engines give Lady M a comfortable cruising speed of 16 knots and she was most recently refitted in 2011. Guests are promised a relaxed cruise under the care of Captain Ben Gillard and a professional crew of seven. 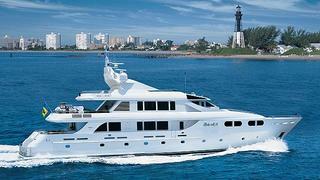 Lady M is available in January and February at a weekly rate of $110,000, discounted from $125,000.